What Are the AA Promises? Alcoholics Anonymous (AA) has a set of principles to help alcoholics in recovery become productive members of society. 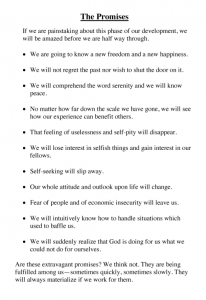 These AA promises derive from Alcoholics Anonymous twelve steps and twelve traditions. Let’s break the AA promises out so they are easier to digest. 3. We will not regret the past nor wish to shut the door on it.We will comprehend the word serenity and we will know peace. 5. We will see how our experience can benefit others. Are these extravagant promises? We think not. They are being fulfilled among us -sometimes quickly, sometimes slowly. They will always materialize if we work for them. – Alcoholics Anonymous p. 83-84. What do the AA Promises mean? The AA Promises are meant to be a promise for recovery. The AA promises usually begin to come true after an alcoholic has worked through the steps thoroughly and begins to apply them in their life. When it says that they will be “fulfilled among us-sometimes quickly, sometimes slowly” it means that the AA Promises will happen, but the time frame in which they present themselves are different for everyone. The AA promises will always materialize if the alcoholic works for them. This means that if you are working the twelve steps to the best of your ability and are as honest as you can be while working them, you will receive a spiritual awakening or experience, which then leads to a total personality change.